John Green, his brother-in-law Samuel Demorest, and his two sons Samuel and Clark are credited with being the first settlers to improve their lot in the area. Soon after clearing land, Samuel built a shack, then returning to Otisco Township to fetch his wife and four children (Kass). 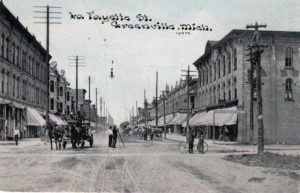 Greenville’s Main Street Circa 1897. When John Green and Samuel Demorest first arrived, they found a plethora of pine trees north of the Flat river. Seeing this as an opportunity to make money and produce goods, they quickly built a sawmill near present day Franklin Street. The second coming to the area in 1844 with the addition of the Josiah Russell family. By 1875, there were 10 lumber, shingle, lath, and sash mills all along the flat river in Greenville with many more in settlements to the North. The boom lasted until 1890, when the supply of area timber ran out. This burgeoning businesses drew new faces as well. Others, particularly of Danish origin, began to plant families in the area soon thereafter (Kass). The Flat River near the Franklin Street Dam. 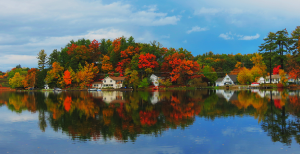 By 1850 there were 461 individuals living in Eureka Township, the area of which Green’s mill encompassed nearly all of. By 1890, those numbers neared 3000 individuals. Nearly a third of the 1990 census population. 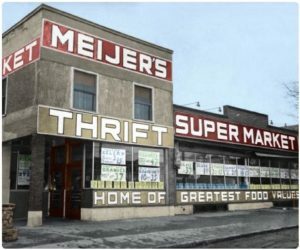 The area was platted in 1853, and by 1867 it was it’s own village thanks to a vote by the Michigan legislature. It came to rest as the City of Greenville on March 10th, 1871. Greenville’s welcome sign, alluding to some of Greenville’s notable accomplishments. 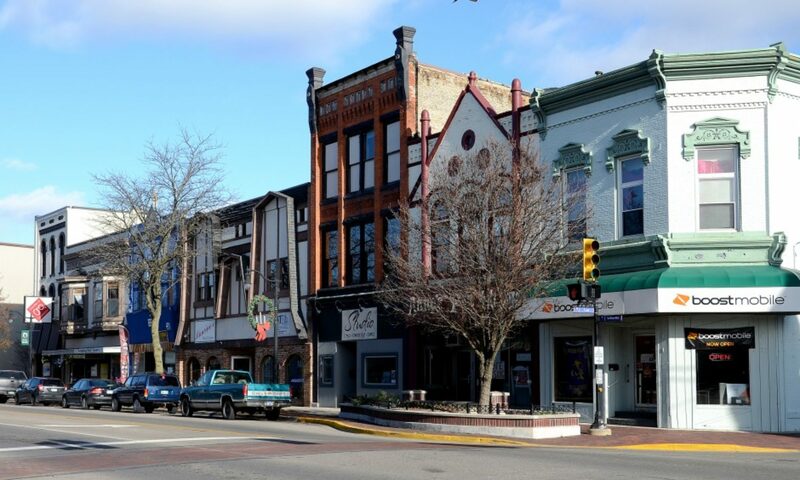 Greenville at the turn of the twentieth century was home to sawmills, tanners, lawyers, shoemakers, butchers, wagon and harness makers, tailors, and saloon keeps. The most important of these however, may have been hotel owners opening business to support a growing number of visitors. 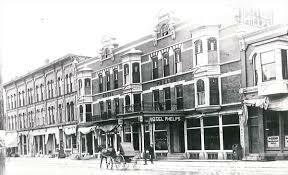 Two notable instances were the Hotel Phelps and the Winter Inn. The Hotel Phelps, on present day Michigan Highway 91. Opening in 1887 by T.I. Phelps. 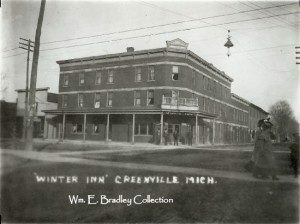 The Winter Inn, standing at its current location at 100 N. Lafayette. Founded in 1900 by T.B. Winter. 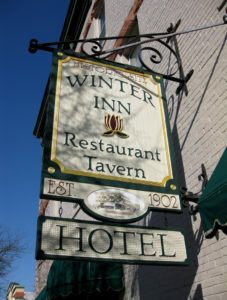 The Winter inn, Still in operation today as a bar and inn. Greenville also had a budding interest in refrigerator manufacturing near the turn of the century. The first of its kind was the Ranney Refrigerator company, selling iceboxes. Soon, this was followed by Gibson Refrigerators led by John Lewis and the companies namesake Frank Gibson. Soon, the area dominated nationally. There are still remnants of these days with AGA Marvel, an offshoot of Ranney Refrigeration. Unfortunately, not all stood the test of time. 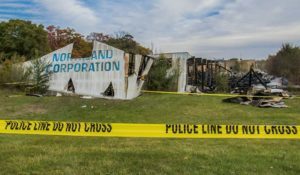 In fact on October thirtieth, the abandoned Northland Corporation building, where Ranney once stood burned in a massive blaze of unknown origin. The charred remnants of the Northland Corporation. 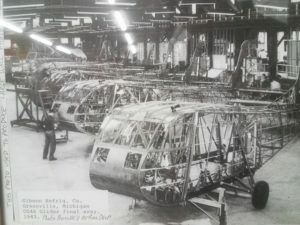 Gibson also made quite an impact during the second world war, producing gliders for the United States Military. 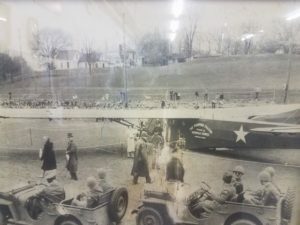 After raising money to purchase a glider, students at the high school named the craft “The fighting falcon”, and this was the lead glider on D-Day in June of 1944. The Gibson Refrigerator factory switches production. The Fighting Falcon preparing for towing. 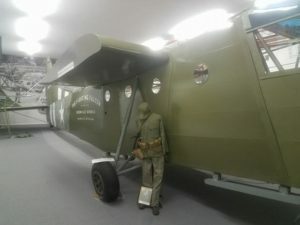 The glider exhibit at the Fighting Falcon Museum. 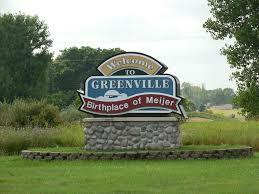 As the welcome sign also alludes to, Greenville is the origin city of Meijer. Founded by barber Henrik Meijer and propelled into success by his insightful son Fred. Danes have had a large impact on the city as well, with celebration coming in the form of a yearly “Danish Festival” every third weekend of August. The event recently celebrated it’s 50th anniversary in 2015. 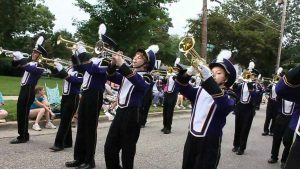 The festivities include a beer tent, parades, and ethnic foods. 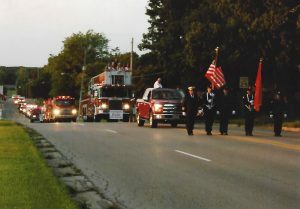 Lining up the parade near Greenville Senior High School on Hillcrest rd. Augustine, Robert. M. (1971) Indians, saw mills, and Danes: the early history of the Flat River area of Michigan. 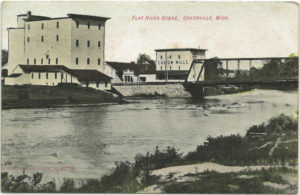 Ionia, Michigan: Flat River Historical Society.